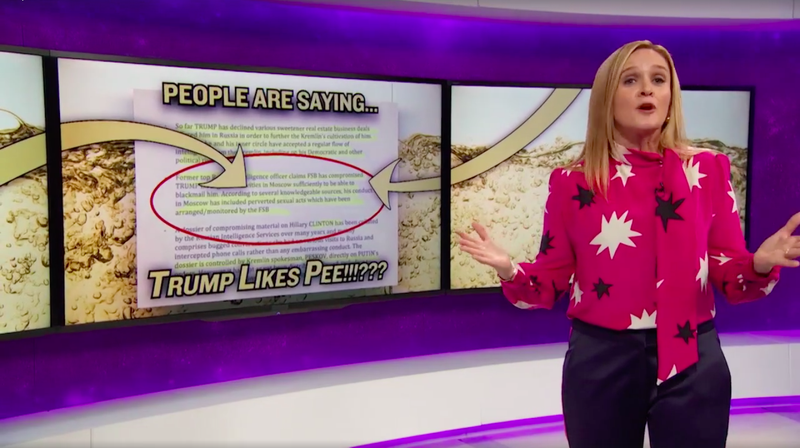 Sam Bee returned to the Full Frontal stage for her first show in 2017, which just happened to coincide with the recent allegations of Donald Trump’s shady dealings in Russia and alleged urine fixation. Lucky for her and even luckier for us, she also had his disastrous press conference as rich, bountiful material. With a healthy dose of incredulity and a lot of verve, she took both on, guns blazing. Both the pee part and the Russia part of the allegations are still unverified, but the fact that we’re facing four years with a man about whom these allegations feel plausible is worrisome to say the least. She concluded the opening segment by saying, “While it’s fun to watch a livid orange Julius explain that he can’t be into water sports because he’s a germaphobe, we may have witnessed what the history books will call the end of America’s tradition of a free press,” before cutting to Trump’s flappy-jawed silencing of CNN reporter Jim Acosta.